For ear cropping, see cropping (animal). Two lambs having their tails docked by the use of rubber rings for elastration. The tight rubber rings block blood flow to the lower portion of the tail, which will atrophy and fall off. Docking is the intentional removal of part of an animal's tail or, sometimes, ears. The term cropping is more commonly used in reference to the cropping of ears, while docking more commonly—but not exclusively—refers to the tail. The term tailing is also commonly used. The term arises because the living flesh of the tail, from which the animal's tail hairs grow, commonly is known as the dock. A lamb in Australia which has not had its tail docked. Tail docking for sheep is, on the contrary, common there. Many breeds of sheep have their tails docked to reduce the buildup of faeces which can encourage fly strike. Also used for this purpose is mulesing. Docking also makes it easier to view a grown ewe's udders to detect potential problems. Depending on the animal and the culture, docking may be done by cutting (knife or other blade), searing (gas or electrically heated searing iron), or constriction methods, i.e. rubber ring elastration. The Canadian Veterinary Medical Association indicates that pain, stress, recovery time and complications associated with docking of livestock will be minimized by docking when animals are under one week of age. However, docking of lambs within 24 hours of birth is not recommended, as it may interfere with ingestion of colostrum and/or formation of the maternal bond. In the UK the law requires that docking on sheep using constriction methods must be performed within the first week of the animal's life. The UK Farm Animal Welfare Council has noted that this limitation can be problematic in management of hill flocks where normal practice is to handle lambs as little as possible during the first week "to avoid mis-mothering, mis-adventure and injury." As with other domesticated animals there is a long history of docking the tails of dogs. It is understood to date at least to the Roman Empire. The most popular reason for docking dog breeds is to prevent injury to working dogs. In hunting dogs, the tail is docked to prevent it from getting cut up as the dog wags its tail in the brush. This is contested by a wide range of groups and is sometimes considered a form of animal cruelty. This has led to the practice being outlawed and made illegal throughout many countries, in some of which dogs are no longer bred for work, or used as working animals. For example, in United Kingdom tail docking was originally undertaken largely by dog breeders. However, in 1991, the UK government amended the Veterinary Surgeons Act (1966), prohibiting the docking of dogs' tails by lay persons from 1 July 1993. Only veterinary surgeons were, by law, allowed to dock. However, following the passage of the law, the Council of the Royal College of Veterinary Surgeons in November 1992, ruled docking to be unethical, "unless for therapeutic or acceptable prophylactic reasons". The requirement in which the Royal College considers prophylactic docking to be acceptable are so strict as to make the routine docking of puppies by veterinary surgeons extremely difficult. Vets who continue to dock risk disciplinary action, and can be removed from the professional register. Those found guilty of unlawful docking would face a fine of up to £20,000, up to 51 weeks imprisonment or both. They can only dock the tail of "working" dogs (in some specific cases) - e.g. hunting dogs that work in areas thick in brambles and heavy vegetation where the dog's tail can get caught and cause injury to the dog. Docking was banned in England and Wales by the Animal Welfare Act 2006 and in Scotland by the Animal Health and Welfare (Scotland) Act 2006. In 1987 the European Convention for the Protection of Pet Animals, established by Council of Europe, prohibited docking for non-medical reasons, though signatory countries are free to opt out of this provision, and almost half of them have done so. Norway completely banned the practice in 1987. Other countries where docking is banned include Australia and the United Kingdom. Originally, most docking was done for practical purposes. For example, a draft horse used for hauling large loads might have had its tail docked to prevent it from becoming entangled in tow ropes, farm machinery, or harness; without docking, it could be dangerous to the horse, painful if the tail were tangled, and inconvenient to the owner to tie up the horse's tail for every use. 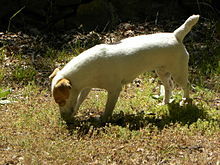 In modern use, the term usually does not refer to tail amputation as it does with some dog breeds. However, historically, docking was performed on some horses, often as foals. The practice has been banned in some nations, but is still seen on some show and working draft horses in some places, and is practiced at some PMU operations. In modern times, the term "docked" or "docking" in reference to the tail of a horse generally refers to the practice of cutting the hair of the tail skirt very short, just past the end of the natural dock of the tail. In particular, the tail is often cut short to keep it from being tangled in a harness. Tail docking of dairy cows is prevalent in some regions. Some anecdotal reports have suggested that such docking may reduce SCC (somatic cell counts in milk) and occurrence of mastitis. However, a study examining such issues found no significant effect of docking on SCC or mastitis frequency or on four measures of cow cleanliness. Although it has been suggested that leptospirosis among dairy farm workers might be reduced by docking cows' tails, a study found that milkers' leptospiral titers were not related to tail docking. The American Veterinary Medical Association opposes "routine tail docking of cattle." Similarly, the Canadian Veterinary Medical Association opposes docking tails of dairy cattle. Cattle on large Australian cattle stations often have the tail brush (not the dock) cut shorter (banged) before their release; this "bang-tail muster" indicates those having been counted, treated, their current pregnancy status determined, etc. Tail docking in the dairy industry is prohibited in Denmark, Germany, Scotland, Sweden, the United Kingdom, and some Australian states, as well as California, Ohio, and Rhode Island. Several large organizations within the dairy industry are against tail docking because of the lack of scientific evidence supporting claims benefiting the practice. Scientific studies have demonstrated that there are numerous animal welfare issues with this practice (such as distress, pain, increased activity in pain receptors in the tail stump, abnormal growths of nerve fibers, sensitivity to heat and cold, and clostridial diseases). Fortunately, there is an effective and humane alternative to tail docking, which is switch trimming. In the case of domestic pigs, where commercially raised animals are kept in close quarters, tail docking is performed to prevent injury or to prevent animals from chewing or biting each other's tails. Wikimedia Commons has media related to Docking. ^ a b Primary Industries Ministerial Council (2006). The Sheep - Second Edition. Model Code of Practice for the Welfare of Animals. CSIRO Publishing. ISBN 0-643-09357-5. Retrieved 2007-01-09. ^ French, N. P., R. Wall and K. L. Morgan. 1994. Lamb tail docking: a controlled field study of the effects of tail amputation on health and productivity. Vet. Rec. 124: 463-467. ^ Thomas, D. L., D. F. Waldron, G. D. Lowe, D. G. Morrical, H. H. Meyer, R. A. High, Y. M. Berger, D. D. Clevenger, G. E. Fogle, R. G. Gottfredson, S. C. Loerch, K. E. McClure. T. D. Willingham, D. L. Zartman and R. D. Zelinsky. 2008. Length of docked tail and the incidence of rectal prolapse in lambs. J. Anim. Sci. 81: 2725-2762. ^ CARC. 1995. Recommended code of practice for the care and handling of sheep. Canadian Agri-Food Research Council, Ottawa. 37 pp. ^ "Castration, Tail Docking, Dehorning of Farm Animals". Archived from the original on 2006-03-05. ^ a b FAWC. 2008. FAWC report on the implications of castration and tail docking for the welfare of lambs. Farm Animal Welfare Council, London. 31 pp. ^ "Is the tail docking of dogs legal?". RSPCA Australia Knowledgebase. RSPCA. 2010-08-03. Archived from the original on 2011-02-20. Retrieved 2011-02-15. ^ "Tail docking of dogs". British Veterinary Association. BVA. Retrieved 2012-10-30. ^ "Horse Tail Modifications" (PDF). ^ Tucker, C. B., D. Fraser and D. M. Weary. 2001. Tail docking dairy cattle: effects on cow cleanliness and udder health. J. Dairy Sci. 84: 84-87. ^ Stull, C. L., M. A. Payne, S. L. Berry and P. J. Hullinger. 2002. Evaluation of the scientific justification for tail docking in dairy cattle. J. Amer. Vet. Med. Assoc. 220: 1298-1303. ^ "Tail Docking of Dairy Cattle". Archived from the original on 2011-04-14. ^ "Tail Docking of Cattle" (PDF). ^ "Welfare Issues with Tail Docking of Cows in the Dairy Industry" (PDF). ^ "TAIL DOCKING OF DAIRY CATTLE – POSITION STATEMENT". Canadian Veterinary Medical Association. ^ "Tail Docking of Cattle". AVMA. ^ "An HSUS Report: Welfare Issues with Tail Docking of Cows in the Dairy Industry" (PDF). October 2012.